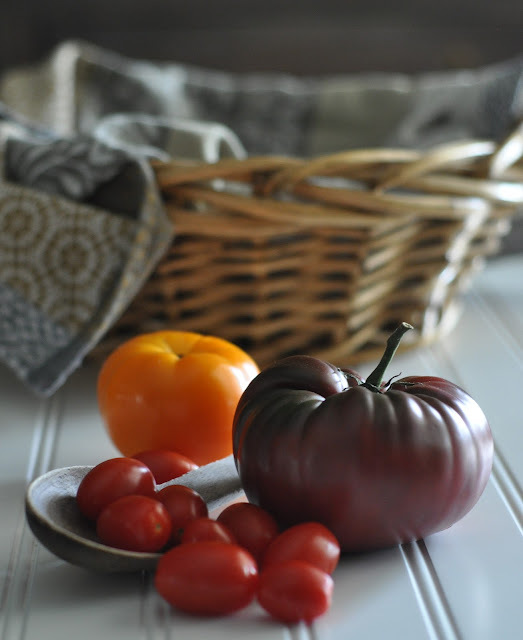 I discovered the Cherokee Purple several years ago and they instantly became my favorite tomato. They have such an interesting history too. We've tried to grow them, with some to little success. Thank goodness we can easily find them at our local farmer's market. Cheers to the Cherokees and their purple tomato. Thank you for the beautiful photos. I found an abundance of these in Michigan last summer and made gorgeous tomato & goat cheese tarts with them. Some times I can get them at Whole Foods in Dallas. Heirloom tomatoes went out of favour as being the ugly ducklings of tomatoes, but today they are considered the most beautiful, at least in my eyes. I tried growing a few varieties in my garden this year, sadly none of this variety but there is always net year! I tried growing Cherokee Purple one year and it didn't do well for me. This, however, has been the best summer for growing tomatoes with the heat and lack of fungus-encouraging rains. I wish I would have planted this one again!